The parish of Buriton seems to have an abundance of grand houses, each of which used to be the focal point of a country estate. In addition to the Manor House (and the more recent Buriton House) in Buriton, there is Nursted House and, on the eastern edge of the parish : Ditcham Park House and the Ditcham Park Estate. About two miles north of Ditcham Park House, beyond Sunwood Farm, is Old Ditcham Farm. Here, too, is a grand building – a remarkable old stone barn, huge and dignified like a church. This part of the parish also contains ‘secret’ clusters of cottages at Downley and Park Barn. This note provides an insight into the ‘far east’ of Buriton – and also gives a flavour of life ‘upstairs and downstairs’ in Victorian England. It is possible that the original Ditcham House was located at Old Ditcham. By the sixteenth century there was a manor house at Sunworth but this was damaged by fire in 1550 and never restored. Over two hundred years later, when the estate had passed into the hands of the Cowper-Coles family, the ruins of the old house were pulled down and the materials carried up the hill to build a new house on the present site as a hunting lodge: Ditcham Grove. In 1868 the 1,600 acre estate was bought by Charles Cammel (of Cammel Laird shipbuilders). The family had the house enlarged and improved but, having never really used it, sold the estate to Laurence Trent Cave in 1885. The Caves were a wealthy family, bankers from Bristol with connections to plantation owners in the West Indies. As soon as Laurence Cave and his wife Lucy bought the estate, they had the house pulled down and replaced with a larger one. The stones from the lodge were apparently taken back down the hill and used around Old Ditcham farm house. The new Ditcham Park House was finished in under a year, at a total cost of under £5,000. The Caves’ house in Belgrave Square was sold and the furniture moved to Ditcham. On the evening before the family were due to move in (4 March 1888), the caretaker lit the boilers, quite possibly for the first time. It was certainly the last time for, having gone out for a walk to Chalton Down, he turned round to admire the view and saw the new house in flames. It was some time before he could summon help, by which time the house was completely ablaze. The whole house was gutted and had to be pulled down, except for one corner which survived. Park Barn cottages were built so that the family could live there whilst Ditcham Park House was re-built under the guidance of the distinguished architect Sir Arthur Blomfield. The new house incorporated a mix of styles (a popular trait among Victorians) and used local Rowlands Castle bricks. It was one of the first houses in the country to be equipped with electricity. There was a generator and an adjoining stable was filled with huge glass lead-acid batteries. Laurence Cave died in 1899 and the estate passed to his eldest son, Captain Charles Cave and his wife Mimi. The local newspaper of 29 May 1903 recorded that “on Friday, Mr and Mrs Charles Cave came to reside at Ditcham Park and received a warm welcome. The carriage drive was decorated with flags and the house bore messages on banners. The horses were taken from the carriage and willing hands drew it home”. Charles Cave was a distinguished meteorologist and released weather balloons from Ditcham to record the temperature and humidity in the upper atmosphere which he felt was necessary “to assist the development of the flying machine”. He had five children, and the family was supported by 14 indoor and 14 outdoor servants. Although Lord Rea owned the house for eleven years, he never lived in it and he sold it to Colonel Ebenezer Pike who, amongst other things, had greenhouses built where there was once a kitchen garden. When Colonel Pike left the house it was bought by Stanley Bond, Chairman and Governing Director of Butterworth & Co. Ltd. who published legal books. For a time Mr Bond brought his printing works to Ditcham – presses, lithographers, typesetters and all – and operated under the name of the Dycheham Press. The house was requisitioned in 1940 by the Admiralty as a convalescent home for sailors and was used for ‘channel surveillance’ operations after D-day. At this time there was a nine-hole golf course, tennis courts and squash courts. And, apparently, every Thursday night a train from Portsmouth would unload passengers at the nearby Woodcroft Halt to be taken to the house in Bedford lorries for the entertainment of the sailors. Lorries were then provided the next morning to take the same passengers (all ladies) back to Woodcroft Halt and thence by train back to Portsmouth. In 1948 the Douai Abbey Trustee Company bought the house and used it as a boys’ preparatory (boarding) school, making a number of alterations changes to the building. 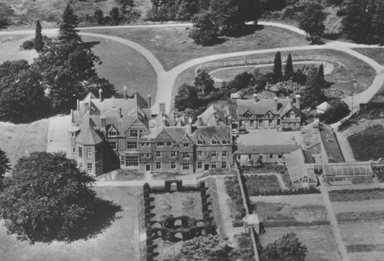 In 1975 the Douai monks expanded their main school near Newbury and sold Ditcham to a property company who, in turn, sold off the cottages and grounds. After interest from a number of prospective buyers, the house was bought in 1976 and Ditcham Park School Limited opened it as the present co-educational day school. Ditcham Park at the beginning of the twentieth century appears to have been a happy place to live and work. The Caves cared about their employees and, in return, they received gratitude and respect. They built a private school on the estate, at Park Barn, for the children of their employees. Dorothea Williamson, the daughter of the estate’s carter, was born at Sunwood Farm in 1902 and recalled that there were up to 30 children at the school. She remembers that the schoolmistress was a Miss Walcott, from Liverpool, and that she was ably assisted by a Miss Adcock who took care of the little ones as well as keeping house for her brother, the head gardener on the estate. Another teacher recalled by Dorothea was a Miss Alice Morgan. The school was closed in 1922. Dorothea also had vivid recollections of Christmas at Ditcham when, on Boxing Day, the estate workers and their families would be invited to the house. “There would always be a bright Christmas tree, plenty of food and presents for the children and adults alike. The adults were usually given linen but the children could ask for anything they wanted”. Victorians liked to impress their guests by displaying wealth and possessions and the Caves were probably no exceptions. Guests coming to dinner, the main form of social contact at the time, would step out of their carriages straight into the porch after being brought up the long drive which would show off the estate. And the house had been built with an impressive oak-panelled hall for greeting visitors and an elaborately carved staircase nearby. Both would probably require polishing by servants every day. The house was furnished with purchases made in Italy and included a bathroom with a covered bath so as not to offend the eye. It was quite common for a family, when entertaining, to hire a professional pianist to play in the drawing room for the evening. On one notable occasion in December 1893, Ignacy Paderewski (a famous piano virtuoso and one-time Prime Minister of Poland) was brought from London to play at a dinner party at Ditcham House. As he was under contract to Bluthner, he insisted on bringing his own piano, refusing to play the Caves’ Bechstein. His instrument had to be carefully packed away and sent ahead of him by train and hauled all the way from Petersfield to Ditcham. It was then manhandled into the drawing room, unpacked, set up and re-tuned ready for his performance, all at the Caves’ expense. Until World War Two there was a railway halt at the bottom of the South Drive. Apparently, the Caves could arrange for a train to stop there to take them up to London or to bring guests to Ditcham Park House, perhaps for shooting parties at weekends etc. This would avoid the five mile carriage ride from Petersfield. Sir Richard Cave, one of Captain Cave’s children, can recall the occasion that one of his aunt’s ‘came out’ at Ditcham and a special train was hired for the guests from London. It was arranged for it to stop at Woodcroft and at 1.am the driver was heard tooting, indicating that he was ready for the return journey. The Cave family were prominent Catholics and played a large part in the building of a Catholic Church (St. Lawrence’s) in Petersfield. Ditcham House had a fine, tall chapel dedicated to Saint Philip Neri. Captain Charles Cave would read prayers in the chapel every morning whilst the family and any Catholic visitors would sit in the balcony and most of the indoor staff would stand downstairs. On Saturday evenings one of the servants, Mr Watts, would go into Petersfield to collect the priest from St. Lawrence’s. He would stay the night in a room next to the chapel and say mass the following morning for the family and servants. At Ditcham there appears to have been a footman, butler, two under butlers, a pantry boy, cook, housekeeper, scullery-maid, between maid (one who both cooked and cleaned, looking after the servants), three housemaids, a kitchen maid (and at times even a second and third kitchen maid), a lady’s-maid, nurse, nursery-maid and schoolroom-maid. There were only five Caves living at the house; the need for so many servants to cater for them was partly the result of the high standard of food expected when catering for guests. 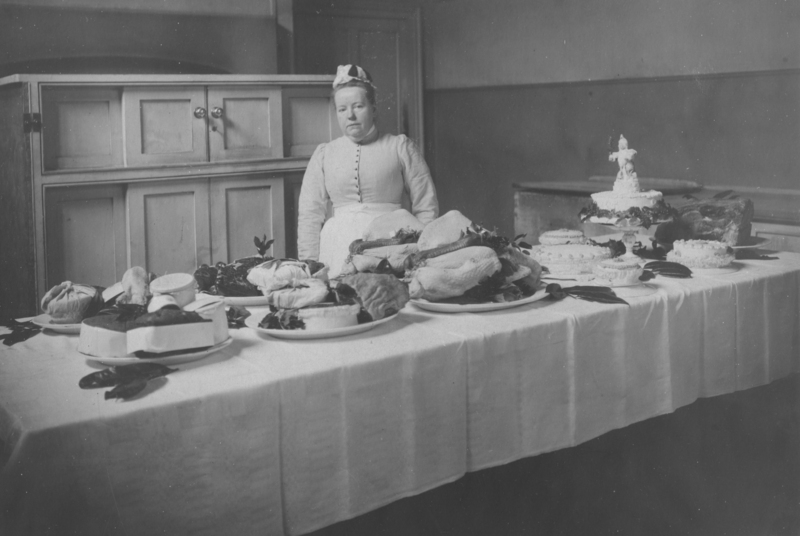 It is some indication of the extravagance of Victorian food that it now takes less space and fewer staff to cook for all the school pupils than it did to cook for the Cave family and their servants. The day to day supervision of the household staff was undertaken by Walter Wright, the butler, and Mrs Haseley, the Housekeeper. Mrs Haseley would generally supervise all the female staff and would be responsible to Mrs Cave. Mr Wright reported directly to Mr Cave. Mrs Haseley was also the cook and so she had to make sure that everything was kept well-stocked as well as doing the household accounts. She had her own room in the house which doubled as a work room and office. The butler also had his own room but, being married, he also had a house at Park Barn. A number of other servants also lived away from the house at Park Barn: Mr Adcock (the head gardener) and one of the under-gardeners – both of whom had families. Living at Downley at the time of the 1891 census were Mr Watts (handyman and carrier) and Mr Dunkley (electrical engineer). The 1901 census shows Mr Watts still in residence at Downley along with Mr Pay (who was a woodsman and his wife worked in the laundry) and Mr Hayes (an electrical engineer whose wife was a kitchen-maid). Later residents of Downley include Mr Newman (coachman) and Mr Cresswell (engineer). Other woodsmen and gamekeepers, who maintained the woods to the west of the house, probably lived in lodges along the drives. The remainder of the servants ‘lived in’ – the maids probably in bedrooms on the top floor of the servants’ wing, some others in houses around the courtyard and some of the nursery staff probably lived in the children’s nursery. Captain Cave had three boys and two girls who would have eaten, played and slept in the nurseries – only seeing their parents when they came to visit them. It is likely that employees who worked on the farms on the estate came under the control of Edwin Hill, the Bailiff, who lived at Old Ditcham Farm. Mr Hill had been instrumental in encouraging Joseph Williamson to move from Northampton, where he worked for the Duke of Buccleugh, and come to work at Ditcham in 1888 as a carter. Mr Williamson’s grandson still has a copies of letters offering Joe the job, at a wage of 17 shillings (85p) a week and offering Mrs Harriet Williamson work in the estate’s laundry and ‘as much wood as they wanted’. Another letter explains how they should travel down to Ditcham, changing trains in London, and tells them to let the railway company move all their furniture – to be paid for by Mr Cave. Because their furniture failed to arrive on the same train, they stayed with Mr Hill for their first few nights before moving into Sunwood Farm – their home for the next 32 years. Joseph Williamson was, amongst other things, responsible for the ploughing and harvesting around Sunwood Farm and, during the first world war, his wife also worked in the fields – leaving their young daughter Dorothea to keep the home. Whilst working in 1917 Joe had an accident and broke his leg quite badly. It took two hours for the ambulance to arrive to take him to hospital but Mrs Cave waited with him all the time, keeping him dry with an umbrella. Horses were very important to all families living in isolated houses like Ditcham. Before the arrival of motorised transport to Ditcham Park in about 1905, horses provided the only available means of transport. The family and their senior household staff would travel by horse-drawn coach or pony and trap. At the beginning of the twentieth century – Ditcham’s hey-day – the stables housed about eight horses and ponies; and four or five carriages and carts. The coaches and horses were looked after by a coachman (Mr Scarret) and a stable-boy, re-titled chauffeur and chauffeur’s mate when the Caves started owning cars. Captain Charles Cave, owned some of the first cars in the country – one with the number plate A3. George Watts, the handyman and carrier, did the shopping in Petersfield or Harting for the house and for the occupants of Downley, Park Barn and the lodges. He was, apparently, unable to read or write and it was usual for him to collect the daily shopping list from the housekeeper and then drive the pony and trap to his home at Downley where his wife, Rhoda, would read the list to him and he would commit it to memory. Either he or the coachman would have collected visitors from the station or taken the family there when they went out. Mr Watts was succeeded by George Newman who, in his younger days, had been one of a group of men responsible for maintaining and repairing the Estate’s four miles of roads. Mr. Newman’s grand-daughter, Christine Holmes, can recall that the horses he cared for were his pride and joy, and that their stables were spotlessly clean. Mr Newman used to go into Petersfield once a week with the horse-drawn carriage to do all the shopping. Milk came up to ‘the big house’, as it was known, in huge churns from Old Ditcham where cattle were kept. Two of Mrs Holmes’ uncles also worked on the estate. Frank Newman was an assistant groomsman, working with his father, George. Arch was a gardener. Mrs Holmes can recall that there were very large gardens: “kitchen gardens which provided all the vegetables for ‘the big house’ and also extensive flower gardens – all immaculate, not a weed in sight”. The hand-mown parkland and lawns were quite vast and there was also a large orchard where children would enjoy going scrumping. All the dwellings on the Ditcham Park Estate were built to house estate workers. At Downley there was also a laundry and a slaughter-house. The estate engineer, Mr Cresswell, lived in one of the dwellings there. He maintained the locally generated electricity supply and looked after the engine that pumped water up to a number of underground reservoirs near Ditcham Park House. The estate got its water supply from a 280’ bore-hole at Downley which still exists today. There used to be an ice-house in the field to the south of Ditcham Park House which was used to store ice brought in from Petersfield lake during the winter months. A nine-hole golf course was built on the estate in 1894 and one of the holes was known as “Icehouse Hole”. The main house also had a Racquets Court which, during the 1950s and 60s was used as a chicken coup. The chicken litter was nearly two feet deep when Ditcham Park School took over the property in 1976. Mr Cave would have kept in direct touch with the Head Gamekeeper, Luke Gumbrell, as guests were often invited to come and shoot pheasants, partridges, rabbits and hares. 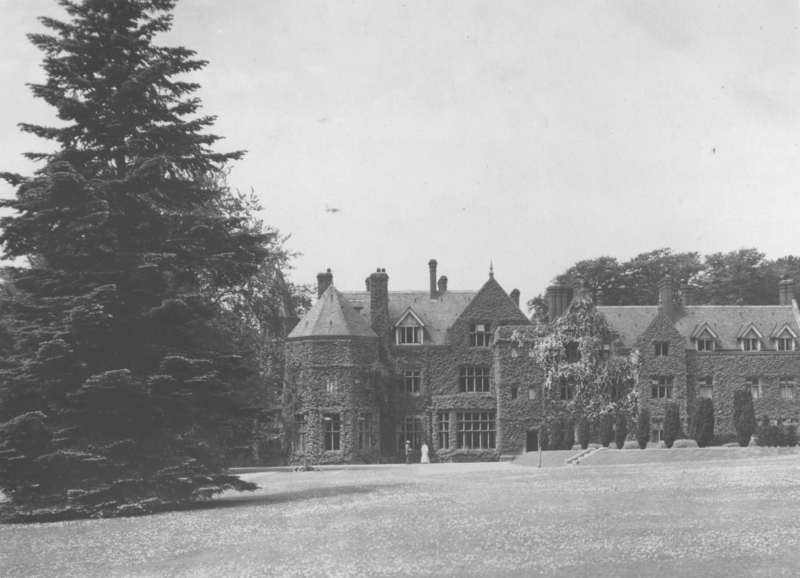 The Gumbrell family were housed at Coulter’s Dean and later at North Lodge. Mr Gumbrell would plan where to raise all the birds and recommend which parts of the estate should be included in any particular shoot. He would also help to make sure that important guests were not placed in positions where they were unlikely to see many birds. Neighbouring tenant farmers were most likely to be allocated these positions! 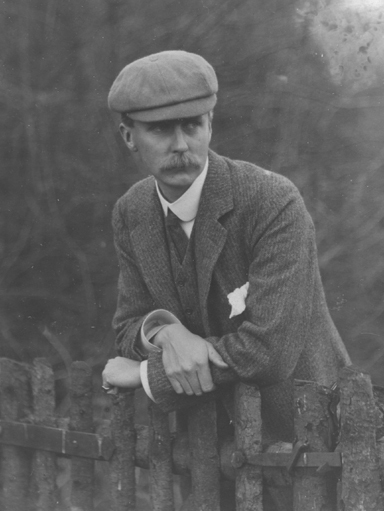 Mr Gumbrell was supported by three Under Keepers, two of whom were brothers: Fred and Charlie Penton. Charlie later married Nellie Gumbrell, the elder daughter of his boss. Nellie had worked as a House Maid for Percy Seward at Weston Farm and died in 1982 aged 94. Mr Gumbrell was killed in an unfortunate cycling accident in 1910, having worked on the estate for thirty years. Harry Harrison came to Ditcham, with his wife Mary, about a year later and took on the role of Head Gamekeeper. When the Caves sold the estate in 1922, they had the two ‘New Cottages’ built at Hurst for some of the estate workers. Joe and Harriet Williamson were given one and Mr Pearce, one of the gardeners, lived next door. These two cottages went with Old Ditcham Farm when the estate was split up and have subsequently been sold off. The history of Old Ditcham Farm is linked with Ditcham Park Estate, of which it was a part, until it was sold as a separate entity in 1922. There are records of tenant farmers as far back as the beginning of the seventeenth century and, like the rest of the estate, the farm was owned in turn by the Cowpers, Cammels and Caves. Farm bailiffs living at Old Ditcham Farm whilst the Caves owned the estate included Edwin Hill and Henry Killick. Prior to the Caves’ ownership, William Boys had been the farmer for around a quarter of a century. Census records show that he farmed about 500 acres and employed ten men and eight boys. He and his family also had three or four indoor servants. When the Cave family sold the estate it was split and Old Ditcham Farm was purchased by the Bennion family of Nursted. The Nursted Estate had to be split up and sold in 1974 and the farmhouse had new owners once again. Earlier research by Dennis Haggard suggests that although the nearby barn probably dates from the seventeenth or eighteenth century, the present farmhouse is principally nineteenth century – probably rebuilt in 1873 after a fire. The kitchen and bakehouse may, however, belong to an earlier house as there are a number of large oak beams and the remains of several doors which have been bricked up. There is a fine flagged stone floor in the kitchen. The exterior of the massive barn is made of malmstone and flint with brick details but inside there are six very large pointed arches of rubble malmstone, instead of conventional timber trusses. A plan of the “Paramountship of the Manor and Parish of Buriton”, dated 1793, suggests that the barn was originally cruciform in shape. Dating the barn has baffled experts over the years but it certainly pre-dates the nearby farmhouse. In August 1972 a huge fire threatened to destroy the magnificent barn. Firemen from Petersfield arrived to find flames roaring through the roof of the barn. Nearly 20 tons of hay and straw inside were well ablaze and flames were spreading towards a further 20 tons stacked at one end of the building. Reinforcements were called from Horndean, Waterlooville and Midhurst but the firemen had no water! Fire engines had to run a shuttle service to Petersfield and South Harting (two miles in either direction) to bring water and the firemen at the scene managed to confine the flames to the central part of the barn. Part of the middle of the much admired roof was burned out with slates and timbers crashing down into the barn. It is a testament to the owners that the complete barn was subsequently lovingly restored. 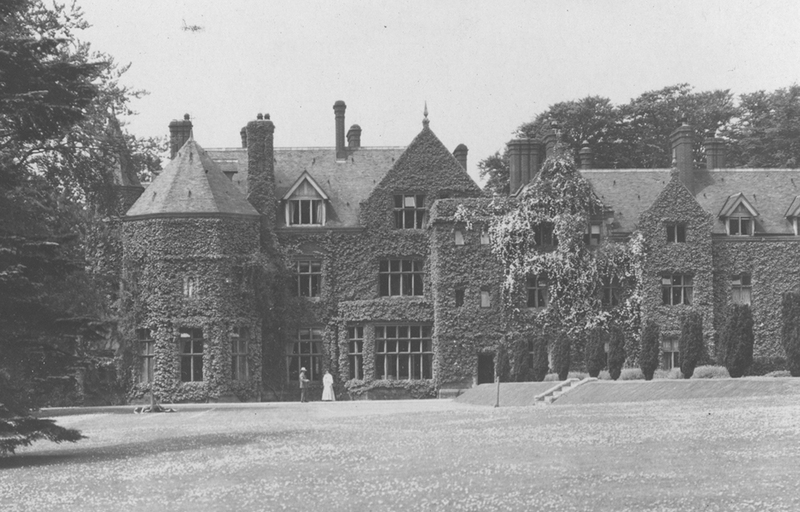 Sunwood Farm had also long been part of the Ditcham Park Estate until it was sold away in 1922. It was subsequently sold by auction in November 1950 and, at that time, it comprised a modern farmhouse and five cottages (a bungalow called ‘Downley’ and two pairs of semi-detached cottages, one pair of which had been built relatively recently) with about 305 acres and a range of farm buildings for a compact dairy and stock farm. Sunwood Cottage is the original cottage at Sunwood and was originally thatched. Census records show that as well as agricultural labourers, there had generally always been a shepherd and his family living at Sunwood. Notes kept by the Cave family show that they considered Sunwood to be a particularly picturesque farm. They also recorded that all the poultry kept there was black. This information was written in 2002. Do you know any more about Ditcham, Sunwood, Downley or Old Ditcham ? Or about any of the people who have lived the area in the past ? Do you have any old photographs of the area ?